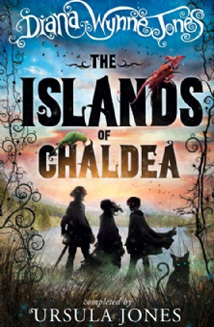 This is a brilliant last novel by my sister, Diana Wynne Jones, which, unhappily, I had to complete. Diana was a truly wonderful writer and I know readers will love it. But be warned: it's hard to put down once you start it. How are you supposed to turn into a Wise Woman if your powers just won’t show up? Aileen is convinced she’ll never become as magical as her Aunt Beck. Then one day her aunt is set a seemingly impossible mission. She must go to the island of Logra and rescue the kidnapped High Prince from the enemy, and Aileen must go with her. They set off along with Ivar, Aileen’s spoilt cousin, and Ogo his clophopping servant, recruiting on their way a huge and elusive cat, a monk with an uncannily wise parrot, and a boy inventor who keeps a pet lizard up his sleeve. But this is no band of mighty warriors, and the evil Lograns and their wizards have blocked their way with an invisible barrier in the sea. Aileen doubts that even with all the magic in the Islands of Chaldea, including Aunt Beck’s, they will be able to penetrate it. The celebrated fantasy novelist Diana Wynne Jones died in 2011, leaving an incomplete manuscript of a final work. Her sister, Ursula Jones, took over at an unknown point, and you can't see the join. ...... the originality is in the underlying wisdom, quirkiness and observation, and in the writing, such as: "I hated the way he smiled, as if he were tasting you. A delightful and assured quest adventure. Aficionados grateful for a bittersweet last encounter with DWJ and newcomers, young or not so young, will slip under the surface of this clear, assured quest fantasy with barely a breath...... Trying to detect the moment at which Ursula Jones takes over is particularly challenging – none of the book's advance readers (including me, despite a 20-year addiction) have been able to pinpoint it without being told.